I have been connected with the “Zimnys” since 1st April 1990, which makes me a part of this practice’s foundations, something which gives me a great deal of satisfaction. 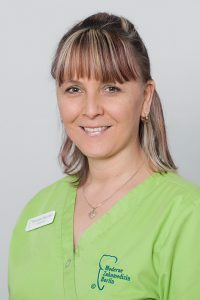 I completed my exams as a dental prophylaxis assistant at the Phillip-Pfaff-Institute in Berlin in 1996. “If this job didn’t exist, someone would have to invent it for you” – this is how many of my patients sum it up. And they are right; my profession is the right one for me, and continues to fill me with enthusiasm. I find it exciting to adapt myself to the various personalities I encounter; and with each and every one, I try to bring the practice’s philosophy to life. In 2012, I have additionally taken the examination to be a TÜV quality assurance representative and I look forward to putting my new skills into practice. In addition, I take on the challenge of Assistant Practice Manager where I support my bosses in all aspects of a large and well-organized practice.